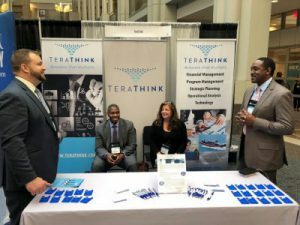 TeraThink recently attended the 2018 Association of Government Accountants (AGA) National Leadership Training (NLT) symposium in Washington D.C. It was our first AGA event since rolling out our expanded offerings after our merger with Dominion Consulting. I attended with Jim Levitan, Howard Campbell, Leslie Hubbard-Darr, Matt Duffy, and Rodney Taylor. 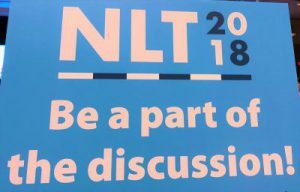 Held February 27-28, the 2018 NLT was one of the largest ever, with 862 participants. The conference served as an excellent platform to learn about the latest trends in Federal financial management in a shared-experience environment. Additionally, it helped showcase TeraThink services at our booth in the exhibitor’s hall. The keynote topic at the conference was the impact that millennials are having in the Federal workforce and how to effectively engage them. It also addressed the challenges of managing four generations in the workforce. Aside from TV shows like “The Love Boat” and “The Bachelor” that separate the generations, many of the presenters shared differing values and motivations in their work experiences. While baby boomers have long held loyalty as a means of advancing their careers, millennials are driven by a desire to learn and grow. Additionally, they are more willing to seek opportunities at different agencies or even the private sector to allow for professional growth. Millennials bring an intellectual curiosity that beg questions like “Why can’t we” or “So what”? Another catalyst that challenges the status quo is that more than a third of the Federal workforce is currently retirement-eligible. This could potentially create mission-critical skills gaps if left unaddressed. These changing demographics are redefining diversity in the workplace and challenging organizations to devise new human capital performance management systems and policies. The future of Federal financial management is immersed in a digital transformation. Robotic process automation (RPA), blockchain, and data analytics were all topics of discussion at the NLT. Agencies have begun deploying RPA to process vendor invoices, eliminating repetitive tasks that were formerly performed by humans. Blockchain is still an emerging technology. Even so, it shows great promise in streamlining transactional processing while improving transparency and auditability. These are important goals for Federal agencies as they work to increase efficiency and trust. Reliable and meaningful data gleaned through data analytics tools helps financial managers make sound decisions. Getting useful, quality data in the hands of financial managers helps agencies effectively manage programs and performance, mitigate risks, reduce improper payments and fraud, and provide greater financial transparency as required by the Digital Accountability and Transparency Act (DATA Act). The ability to deliver more transparency with less resources has been a challenge for agencies. In response to that challenge, managers at all levels must take advantage of recent technological advances and align strategic modernization efforts to enterprise systems. Moreover, organizations must capitalize on the unique capabilities possessed by millennials. Millennials are the largest generational group in the workforce. Organizations need to leverage their technology skills and collaborative communication methods. We are tackling these trends head on by investing in people and technologies. Our solution offerings work together to provide our clients everything they need to transform into an effective digital organization.